The tech revolution in the health industry emerges, with Artificial Intelligence, Electronic Health Record systems and real-time data from improved analytics and various wearable devices. Over the course of the next few years, we will have a clear picture of how much of an impact this revolution will actually be, and if the healthcare industry will change forever and fundamentally. But for now, it remains a revolution, one that can be called a Health 4.0. Today we will talk about Health 4.0, specifically highlighting India region and comparing it to the rest of the world. But before we try to discuss and value various aspects of Health 4.0, let us take a quick history lesson in order for us to properly understand how the industry changed and emerged. The first huge impact of the modular IT systems in healthcare can be seen around years 1970-1990. We can refer to this period as Health 1.0. During the course of the next decade, health IT systems were starting to getting networked. Throughout the same time, EHRs starting being used widely, integrating with the clinical image, helping professionals getting the better perspective in their line of work – truly, the Health 2.0. Starting approximately around the year 2005 and onwards was the time of the genomic development, as well as the rise of implantables and wearables. Health 3.0 can be seen as the integration of all of this collected data along with the already established EHR systems. Health 4.0 comes together now thanks to all of the previously established technologies that are now teamed with an ongoing real-life data collection and the increased used of various AI technologies. The main aspect that drives the thing forward here is not the drastically increase of the amount of data itself, but the ability to value the data more quickly and properly, extracting and highlighting the most critical aspects of it in the process. Data portability is another aspect that adds to the overall mix of the already impressing innovation, allowing both doctors and patients access their medical data anytime anywhere, making the whole process more transparent and trustworthy. Revolution makes the data more effective and consistent. What Health 4.0 does, is that it tries to shift the healthcare industry entirely from something that can be called fee-for-service focused into more value-oriented, which ensures proactive preventions and measures the outcomes. The system has already been established in the United States, where the Department of Health implemented the value-based system of Medicare. Currently, it measures around 90%. Healthcare sector in India is developing with lightning speed and is currently expected to reach US 280 billion marks by the year 2020. But the industry currently remains fragmented, with some of the huge medical chains moving towards Health 4.0, while some of the medical companies are stuck in legacy systems. Taking all of that into consideration, there is a certain number of factors that are currently trying to move these things forward, which can eventually bring the whole process to the revolution phase. The first factor lies in the growth of the middle-class population, which of course have more demands and standards from the healthcare providers than those who struggle to survive alongside the poverty line. Industry representatives and hospitals as a whole are also understanding the change, and now are trying to improve every aspect of their working process, integrating new technological beneficial tools. The second factor is the government itself. In 2017, in its National Health Policy it was stated that the government plans on creating a national IT backbone that will help to integrate EHRs, as well as making them fully portable. It is the initiatives like this, that will undoubtedly move the whole Health 4.0 thing forward. The third factor is an enhanced penetration of health insurance. Insurance companies in India are constantly demanding a better and more well-functioning data collection and analysis system, which forces healthcare providers to look for improvement. The fourth factor is the data revolution that is currently taking place in the country. Initiatives of both Digital India and private sector competition are resulting in affordable and accessible high-speed data connectivity. All of this helps both patients and providers from much smaller towns to gain access to the Health 4.0 tools. The fifth factor lies in the emergence of patient-centered care. Though not quite, since for the proper patient-centered care, new healthcare delivery models need to be implemented. Modern healthcare delivery process in India is a bit outdated. An unhealthy patient approaches the doctor and is then transferred from patient-centered to person-centered care, which primary focus lies more in the prevention of a disease, rather than in its treatment. True patient-centered care should not only take into an account the well-being of a specific individual but also account for his medical history, family disease history, current demographics, patient’s lifestyle, etc. The ultimate goal is to account for all of these factors in order to provide a personalized, effective and coordinated system for every medical facility in India to follow. The benefits for the patient’s side of things here are truly indescribable. 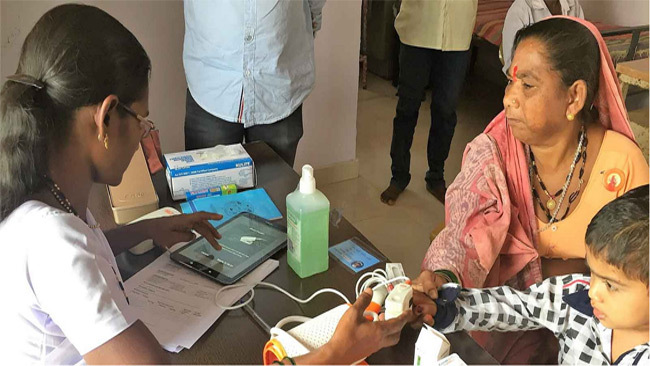 During the last five years, India saw the rise of the consumer-facing healthcare technological revolution topic, that was on everyone’s minds and talks, from government and investors, all the way to the public. And thought there is a stronging competition from Eastern European healthcare development companies, India is building up its positive reputation faster than ever. New tools that are aimed at the average modern customer are rising in popularity: telemedicine, e-commerce for home delivery of pharmaceuticals, online health service aggregators, as well as a noticeable share of shiny fitness apps. Already existing methods are being revisited and modernized, which also helps to improve healthcare delivery, like the chat-based basic healthcare service apps and online consults. This significant need for healthcare technology in order to bridge resource gaps in India, and the huge potential of artificial intelligence to offer various affordable solutions at scale, means that India may finally be poised to realize the benefits of all of these technologies on health outcomes.